Can animals talk like human? This question can be analyzed in different perspectives. Is there any difference between talking and communicating? Can animals talk to humans? Can animals understand human talk? Communication simply means sending information. We can communicate even without talking. For instance if a persons sitting beside you speaks Pushtu accent, you can speculate him as being Afghani. Similarly a person sneezing and coughing gives sign of suffering from cold. So we can communicate without talking. The deaf and mute also communicate using their hands. In short, communication is possible without speech. In this perspective, we can say that all the animals communicate.They might have their own specific medium of communication but they do communicate. You might have come across talking parrots. They speak certain sentences of human language in quite understandable way. Similarly some sea animals like seal can also speak human language sentences. But do they really speak? Do they understand the meaning of the words they are uttering.? The answer is a big NO. For them, human sentences like different sounds. They try to memorize the sounds and repeat them just for fun. They do not understand any word of it. If they could understand our language like we can do. They might have coined new sentences by using different words. But they don’t do it. In short, animals can reproduce human like sentences but for them these sentences don’t make any sense. In Punjab, the farmers use different instructions for animals. Like when they say “Allah Hoo”, the bull cart stops. Similarly in monkey and goat show in rural Punjab, we see how the animals act upon their master’s instructions. From these incidents one can think as if animals understand human speech. But the fact is they can’t. For them again, the human talk is like a signal a sound with no meaning. They use it as a signal and act as they are trained by their masters. You might have also heard about a horse who could do simple math of addition. if you search the internet you may find many articles about it. The master asks him like two plus two and the horse hits the floor four times. Researcher says the horse can give right answer only when the questioner himself knows the right answer. The reasons is most animals can understand body language and facial expression better than human do. So when the horse reaches at the right answer, he observe a change in human expression and thus stops there. So the horse can give the right answer only if he can see the questioner and the questioner himself knows the answer. In short animals can neither talk nor understand human speech. The next point is why? Why animals can not talk or understand like humans? Their are certain features of human language that are lacking in animal communication. Reflexivity means we humans can talk about our talk. Just like we are studying the subject of human language. This is only human. A dog can not bark about barking. A cat not criticize the mewing of other cat. Human can understand displacement in terms of both time and space. Human can talk about past and future. Similarly human can talk about location. Animals do not have this quality. For instance, when you reach home, your pet may make some sound asking for food. if you ask him, “how did you spend your day?” “What did you do yesterday?” He would have no clue to the answers of your questions. Of course honey bees are a little exception. They have the ability to express and understand the displacement. But that property is also limited. They have a special type of dance. When one the bees come across some nectar source, she comes back to bee hive and tells her mates about the location of that nectar source. She does round dance if the source is near quite near to the bee hive (within 10-80 yards). If the source is far away. The waggle dance is done. 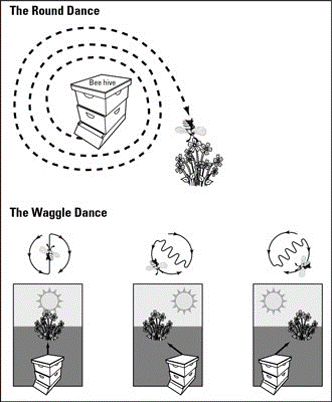 The angle of waggle dance with reference to the sun helps in identifying the source. 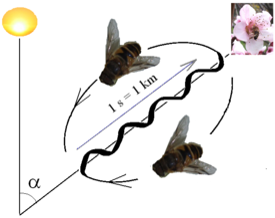 The angle shows the direction of the source and the duration of the waggle dance shows the distance. But this displacement feature is also quite limited. An experiment was done to evaluate the displacement quality of the honey bees. The scientists placed nectar source on the top of a tower and brought some bees there. The bees went back to their hive and tried their best to communicate about nectar source but they could not. All the bees turned mad while searching the nectar source. The reason was, honey bees can not express about vertical displacement. Human language is quite arbitrary. The object and its name has no co-relation between them. Of course we can show in calligraphy by writing fat with fat letters and making “tall” with tall letters and writing cat with cat shape. but in reality there is no relation between objects and its names. Humans are very creative. We can make new words and new sentences according to new situation. But for animals have no way to express in new situation as we already saw the example of honey bees being unable to express the vertical displacement. Some monkeys have different signals in different scenarios. like CHUTTER sound means “Snake is around” and PRAUP sound means eagle is around. Scientists did an experiment by throwing Snake from the sky. If there have been human instead of monkey, he must be have coined some new term using the older ones like “flying snake” or “snake like eagle”. But monkeys could not make any creative expression. They could have said “PRAUP-CHUTTER” or “CHUTTER-PRAUP”. but they did not. Dog whether raised in Punjab or in Canada, will speak like a dog. There would be no change in his expression and voice. But a child although ethnically Punjabi if raised up in Canada, will speak English just like the Canadian do. This the human feature of acquiring the language and culture from the environment whereas animals lack this feature. Human can coin together sounds to creatively create new words. For instance take three sounds of n, i, b. We combine these letter in the same order and we get the word nib. Now if we swap n and b. The new word would be bin. This property of rearranging the same sounds to create new words is called duality and only human. When you go home and your pet dog says “Woof” (I am happy to see you). If the dog could have human ability of duality, he might have coined words like “foow”, “oofw” or “oowf” etc. Animals can communicate by different sounds and actions or signals but they neither can talk like humans nor they can understand human language.